This is an update to the original post on April 17, 2013. The demonstration of the first controlled flight of an insect-sized robot is the culmination of more than a decade's work . . . Half the size of a paperclip, weighing less than a tenth of a gram, the robot was inspired by the biology of a fly, with submillimeter-scale anatomy and two wafer-thin wings that flap almost invisibly, 120 times per second. In addition to the recent suggestion from insecticide producers that we should "plant more flowers" to aid the declining bee population, Harvard's School of Engineering and Applied Sciences has been working with staff from the Department of Organismic and Evolutionary Biology and Northeastern University's Department of Biology to develop robot bees. These insectoid automatons would be capable of a multitude of tasks: autonomous pollination, search and rescue, hazardous exploration, military surveillance, climate mapping, and traffic monitoring - to name a few. 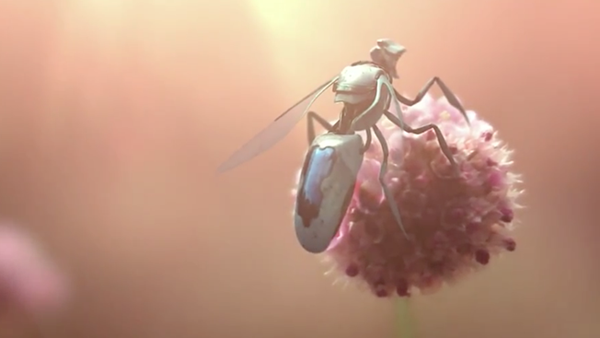 Greenpeace has issued a disturbing new PSA which postulates on what such a world would potentially look like as these robot bees gain autonomy and begin fully populating the natural world.